Head over to Instagram and apply to become an HYDAWAY Brand Ambassador. If you selected you will have the chance to receive FREE HYDAWAY Collapsible Water Bottles. take part in cool contests, get the scoop on all things HYDAWAY & much more. 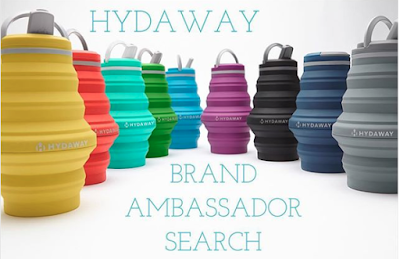 Just send them a message or email that at hello@hydawaybottle.com with your name, email address, location and why you'd like to join the HYDAWAY Crew! Last day to apply is Sunday, July 29th. They will contact you early next week if you were selected.